Die Aktionstage sind damit offiziell vorbei. Wir bedanken uns bei allen Leuten, die uns während dieser vier Tage so tatkräftig unterstützt haben. Unser Dank gilt zuerst all jenen, die aus Leipzig, Erfurt, Freiburg, München, Zürich, Luzern, Salzburg usw. den weiten Weg nach Wien gefunden haben. Wir möchten uns bei Allen bedanken, die dieser Tage für alle Meschen gekocht haben, sich stundenlang an Rechtshilfetelefonen bereit gehalten haben und natürlich bei all denen, die tagelang in der kalten Innenstadt ausgeharrt haben, Flyer verteilt und mit den Menschen gesprochen haben. Vielen Dank auch an die Trommler, den Bikeblock und alle die sonst da waren. 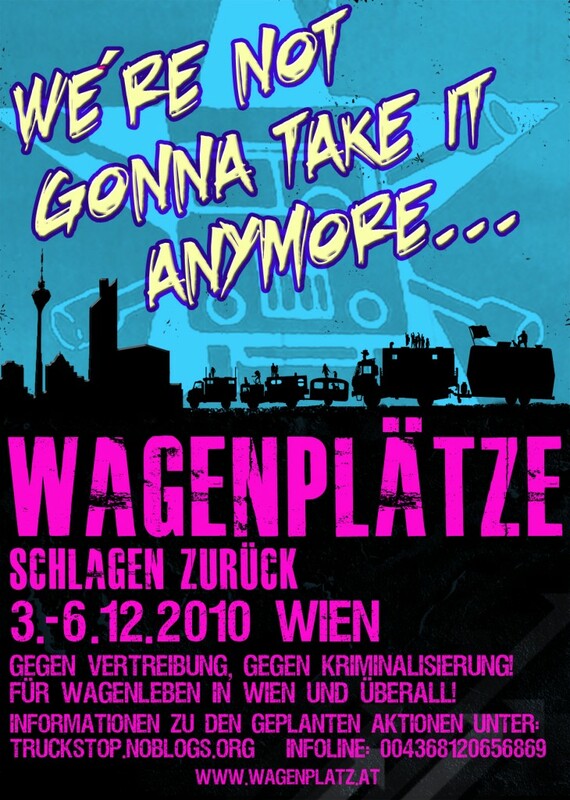 Mehr Wagenplätze für Wien, Hamburg und überall!!! Hurra, die Aktionstage haben begonnen. Ab jetzt werden alle Interessierten hier über diese Seite ständig aktuell informiert. Die Wagentruppe Treibstoff hat bereits den Grundstein für die kommenden Tage gelegt. Donnerstag Nacht wurde ein Grundstück in der Krieau neben dem Wiener Trabrennverein befahren. Dieses Grundstück dient nun für das kommende Wochenende als Basiscamp für alle BesucherInnen. 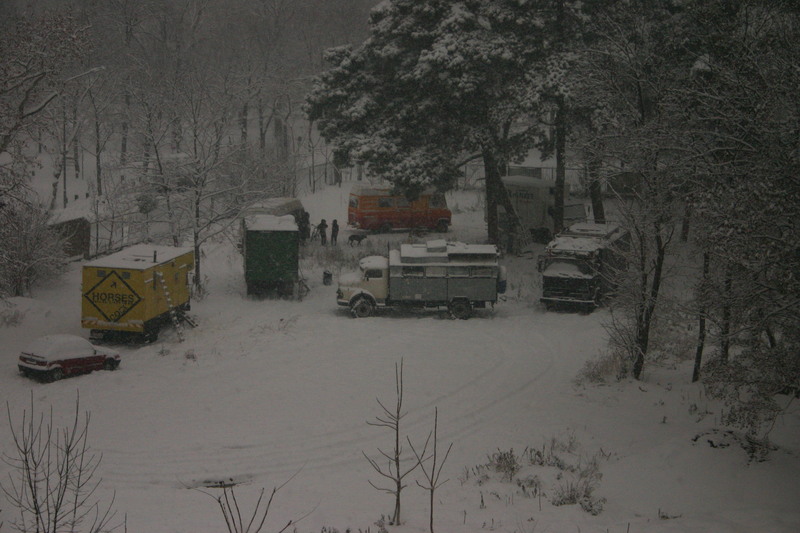 In Vienna about 50 people are living in cars and trailers and the city council have been repressing them for years for no obivous reason. They claim to have legalised one place but did not offer enough space for all and besides there are different groups with different ideas. Not to mention that shortly after people moved to the legal site right next there a big 24 hour building site was to start for the next three years and will cause a lot of noise, dust and annoiance. The message of the city council seems to be people living in cars and trailers are not welcome in Vienna. The city is refusing talks, doesn’t feel responsible and their answer is repression! 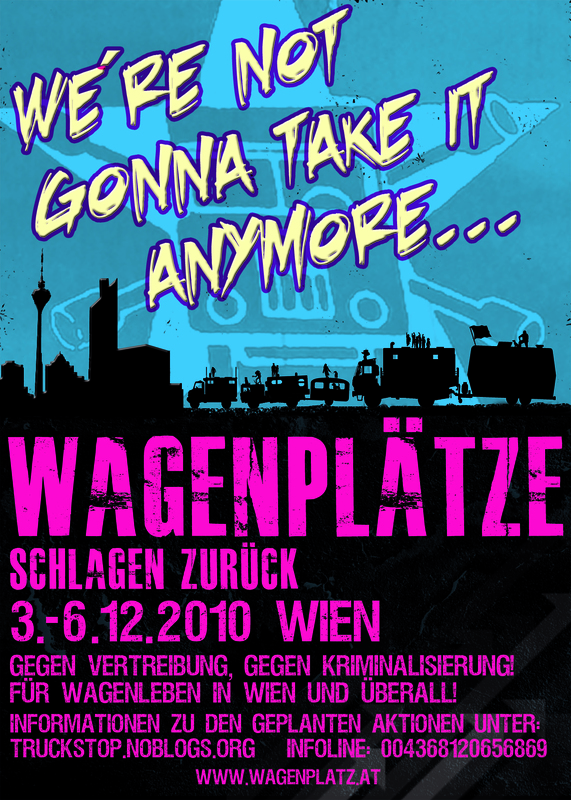 Wagenplätze are very popular in the neighbourhood and it is only the politicians who are not willing to cooperate. Although there are many free sites in Vienna, it is impossible to fill them with life because these places are only for speculation. Politicians in charge present Vienna as a multi-cultural city but ciminalise people who decided not to live in flats and houses. We do not understand why Vienna is lacking a political will! There are a lot of examples in Germany, Switzerland and France where Wagenplätze are common and accepted as a cultural and living project. Why not in Vienna?